Gorgeous shot of the falls, Duchess Linda. You captured the motion of the river. So many similarities between our areas- the Flood of '55 was an incredible natural disaster around here and people still talk about it. I love water photo's of anykind and that is a great one. i love how you are really getting out there with the camera! no grass growing under your feet honey! That would be tough to negotiate in a canoe. That's quite the raging water! Connecticut just doesn't seem like a "hurricane" state to this midwest boy, much less having to endure a one-two punch of double hurricanes. You have a fascinating way of telling local history and I really think you should do a local history book - with your pictures and fascinating stories like this. Travis had the same impression I did. The river looks so wild. It will be good to see it in the summer. Wow! I can almost hear the roar! I can't type much, because my keyboard is broken. It only types about every other letter. It's taking me forever to comment and it is very frustrating! But I wanted to let you know I've moved my blog! A fresh start! I've missed you! Sorry to be gone for so long, but it's nice to come back to see your beautiful photos again. I'll be back as much as possible, promise. Wow Linda, wish I would'a known you were up in Putnam! I recognized the falls right away though. Actually I've been a Putnam boy since 8th grade, when my Memere passed away and we moved to Putnam so my Mom could take care of my Pepere. My Pepere was actually on the rooftop of the Belding Mill during the flood of '55, which is further up the river by Providence St. He was the mill foreman, and was trying to fight the magnesium barrel fires which were floating down the river with a garden hose, lol. Maybe that's where I get my firefighting from? Anyways, just a little extra tidbit. 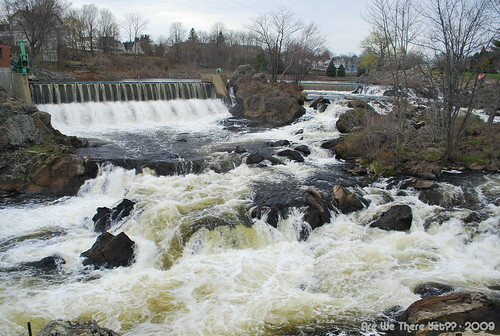 The Quinebaug river once snaked throught the town of Putnam, but after the flood of '55 they straightened the river out and put three dams in, two up by Providence St., and the one you see in your photo. Several neighborhoods were washed away, and some streets ceased to exist. When I was in Putnam Fire several years ago, we were constructing a training tower in the back of the station by the river, and the truck digging the holes for the support poles actually hit an old foundation! Also the village of "Mechanicsville" in West Thompson(just up the river from Putnam) sits at the bottom of the West Thompson Resevoir, which they put underwater when the West Thompson Dam was put in. You can still see an old road, and washed out bridge supports when you go there! Ok, enough of me babbling. Great post Linda!!! I like that pic...but it looks cold there for some reason.